Education and more specifically business and management education have the power (combined with responsibility) to transform people’s lives for the better, creating opportunities and communities that nurture a better future for people in all parts of the global economy. But like nature, everything has a life period.There is no denying that some things will need to be destroyed and something new will need to take its place for the life-cycle to go on. Most responsible Business Schools are realizing that it’s that time of the B-School life cycle where they will be participating in Rethinking the MBA (Harvard professor Srikant Datar). Bias for action got WeSchool started off on this mission early on and as has been their trademark style, they began their journey on an untrodden path, not only in India but one that universities and scholars internationally were slowly beginning to walk on. 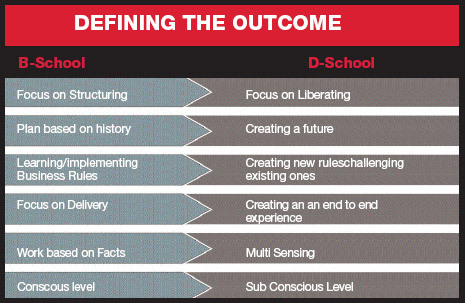 The path of “Design and Innovation”, one that was set to Redesigning MBA education at WeSchool. Accelerated globalization, fast changing technologies, demanding clients and unpredictable socio-economic-political situations create pressures and corporates are forced to create a stream of technological and organizational innovations. In this context a manager should have the ability to multi-sense, the ability to synthesize more than analyze.The very thought of inculcating design sensibilities which would stimulate right brain and whole brain thinking leading to innovation in functional areas of business was in itself an innovative perspective on management education. Design thinking is characterized by Human-centered approach, Nurture a questioning Mind, Multisensory Observation, Cross-domain application, Prototyping. As a result programmes at Welingkar enable a student to have a holistic approach towards management by using his/her creative skills as well as his/her logical capabilities while carrying out any function of management. We School has not only designed management programs with Design Thinking taking a center stage but also set up an ecology that is set to encourage people to put design thinking in action.One such initiative was INNOWE -the Innovation Lab,where the students from various backgrounds can work and interact with interdisciplinary teams on innovative ideas and assignments that will evolve into prototypes of scalable Business Plans. Integrated projects,Triggers for innovation project, the Concept Show and Degree show are all examples of pedagogical approaches which are quite uncommon in the MBA domain. Design thinking integrated into Business education develops holistic thinking and can help managers look at a business strategically beyond the typical silos of Marketing, Finance, HR and Operations. It helps students build scenarios rather than just analyse past case studies, develop a deeply empathetic approach emerging from an in-depth stakeholder analysis leading to better solutions. A corporate manager using this approach can hence be creative / intuitive like a designer without losing his business acumen. The pedagogy being hands on, in fact, imbues the students with the value which prevents them from becoming ivory tower managers and instead prefer to do a human centered ground level investigation of any business problem. Recently, WeSchool has initiated DMagics – an effort to institutionalize Innovation at WeSchool. It is a showcasing of innovative concepts developed by students across various programs at WeSchool.The inspiration for DMagics are the Degree shows which IIT IDC and other Design schools conduct every year displaying the work of their students. DMagics however goes a little beyond and takes the ideas closer to the industry. These DMagics Concepts/projects across various Business verticals and sectors were evolved by following a rigorous Design/innovation process which begins with a deep human centered observation and enthographic study of the sector/project area, identification of unmet stakeholder needs, developing a solution concept which goes beyond the ordinary, doing a feasibility study of the solution leading to a complete working prototype and business plan. December 2011, Weschool will engage corporates in this initiative and move one step further in truly Redesigning the MBA truly teaches us to look and think with different lenses and create actionable and sustainable strategies. An educationist with the qualities of a Leader, his vision and result orientation have been the guiding force in making Welingkar a name to reckon with, not only in India but also globally. Prof. Dr. Uday Salunkhe, a Mechanical Engineer with a Management Degree in “Operations” pursued his Doctorate in “Turnaround Strategies”. 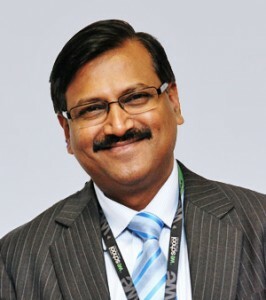 He has a rich corporate experience of 12 years, which includes his tenure with Mahindra & Mahindra, ISPL and other companies.